Suitable for high efficiency isolated dc-dc bus converters. INTERNATIONAL Rectifier (IR) has released two DirectFET power MOSFETs that reduce system-level power loss as much as 10% versus ‘enhanced SO-8’ devices in medium power 200W dc-dc bus converter applications. 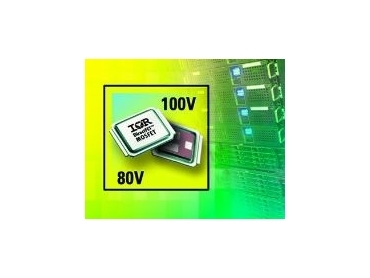 The low combined on-state resistance and gate charge makes the new IRF6668 80V and IRF6662 100V DirectFET MOSFETs ideal primary-side power switches for high efficiency isolated dc-dc bus converters. When the IRF6662 or IRF6668 are used on the primary side of an unregulated 48V input, 8V output, 200W isolated converter, the power density of 97W/in2 can be increased an additional 15%. This is enabled by taking advantage of the dual-sided cooling capability of the DirectFET MOSFET packaging technology with the addition of a heat sink. The 100V IRF6662 has a 4% reduction in device on-resistance compared to competing enhanced SO-8 MOSFETs and a 30% better performance figure-of-merit for combined on-state resistance and gate charge compared to competing enhanced SO-8 devices in 36-75V input, 8V output, 200W, 220kHz half-bridge dc bus converter. The 80V IRF6668 has 10% better on-state resistance and 30% better total gate charge, resulting in a 40% better performance figure-of-merit for combined on-state resistance and gate charge compared to competing enhanced SO-8 MOSFETs, enabling up to 10% additional output current in 48V input, 8V output, 200W, 220kHz half-bridge dc bus converter. The new DirectFET MOSFETs can be used in either half-bridge dc bus topologies with the IR2085S or in full-bridge dc bus topologies with IR2086S, coupled with secondary-side low voltage DirectFET MOSFETs like the IRF6635 for a complete, high efficiency solution.